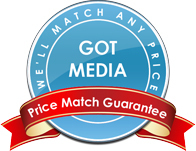 GotMedia.com provides CD and DVD supplies in Orange County, CA. Once you select which type of disc media and printing type you need for your company, there are several other supplies that will be needed. There are many types of CD and DVD accessories you may need such as CD or DVD jewel cases, paper sleeves or thermal ribbons. Also, if you happen to purchase your own duplicator or disc printer from GotMedia.com, you will need disc printer ink cartridges around so that you don't run out! We are always adding products to our CD/DVD Supplies line-up and if you can't find what you are looking for here, just let us know and we can source it for you!